Trim Castle (Irish: Caisleán Bhaile Atha Troim) is Norman castle located on the south bank of the River Boyne in Trim, County Meath, Ireland. 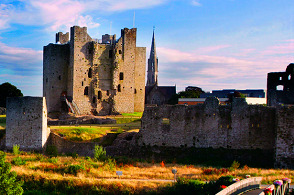 With an area of 30,000 m², it is the largest Cambro-Norman castle in Ireland. 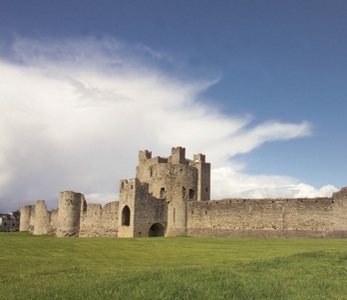 Over a period of 30 years, it was built by Hugh de Lacy, Lord of Meath and his son Walter. The Castle was used as a centre of Norman administration for the Liberty of Meath. De Lacy took possession of it in 1172 and built a huge ringwork castle defended by a stout double palisade and external ditch on top of the hill. The ringwork was attacked and burnt by the Irish but De Lacy immediately rebuilt it in 1173. His son Walter continued rebuilding and the castle was completed c 1224. The yellow steeple named for the way the sun sets and rises on it giving it a yellow colour, is the remains of a 14th century abbey on a hillside near the historical town centre of Trim and is the tallest building which can be seen for many kilometres around the town. 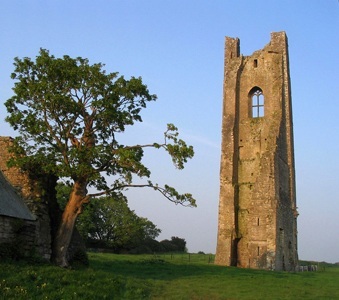 The steeple is one of the many major historical ruins found in Trim and was originally part of the Augustinian Abbey of St. Mary. It was used as a bell tower and as a place of refuge. The Yellow Steeple dates from 1368 but damaged by Cromwell's soldiers in 1649. The River Boyne (Irish: An Bhóinn or Abhainn na Bóinne) is a river in Leinster, Ireland, the course of which is about 112 kilometres (70 mi) long. It rises at Trinity Well, Newberry Hall, near Carbury, County Kildare, and flows towards the Northeast through County Meath to reach the Irish Sea between Mornington, County Meath and Baltray, County Louth. 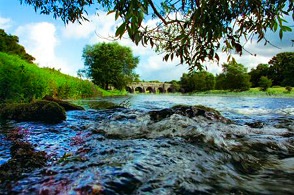 Salmon and trout can be caught in the river, which is surrounded by the Boyne Valley. 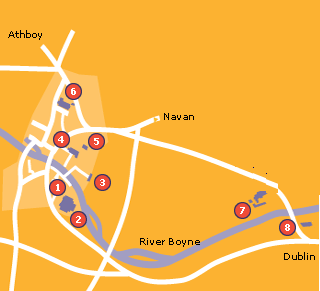 Despite its short course, the Boyne has historical, archaeological and mythical connotations. The Battle of the Boyne , a major battle in Irish history , took place along the Boyne near Drogheda in 1690 during the Williamite war in Ireland . It passes near the ancient city of Trim, Trim Castle, the Hill of Tara (the ancient capital of the High King of Ireland), Navan, the Hill of Slane, Brú na Bóinne (an archaeological site), Mellifont Abbey, and the medieval city of Drogheda. The Wellington Monument is a freestanding limestone-built memorial, erected 1817. It comprises a Corinthian column on a panelled pedestal surmounted by a statue of the Duke of Wellington. The pedestal stands on steps which are surrounded by cast-iron spear-headed railings and by a cast-iron chain supported by carved limestone bollards. The inscription is in raised lettering on the north face and it has a carved benchmark on south face of pedestal. 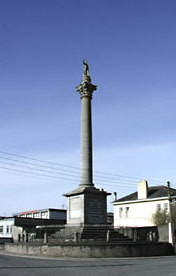 This imposing monument to the Duke of Wellington, is located at a prominent crossroads within the town of Trim. 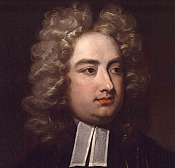 It was designed by Architect James Bell. The architectural quality of this monument is emphasised by the quality of the materials used. The artistic capability of the sculptor, Thomas Kirk, who carved the figure of Wellington is also very apparent. The inscription reads: 'This columnn erected in the year MDCCCXVII in honour of the illustrious Duke of Wellington by the grateful of the County Meath'. Newtown Abbey lies on the banks of the Boyne and is about a15min scenic walk along the majestic River Boyne from FRANZINIS and Trim Castle. 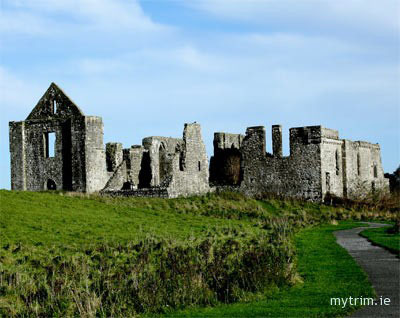 It was an Augustinian Abbey and was once the largest Abbey of its kind in Ireland. It is still used as a graveyard for the town so there are no guided tours but there are lots of information boards with pictures of what certain areas used to look like. The Abbey Church was the sanctuary for "Our Lady of Trim", a wooden statue reported to work miracles. The statue made Trim a major pilgrimage site from at least 1397. During the Reformation, the statue was burned and Henry VIII dissolved the Abbey. The Abbey's bell tower, the "Yellow Steeple", is the primary remnant of St. Mary's. The Black Friary was a Dominican Friary located in Trim, County Meath, Ireland. 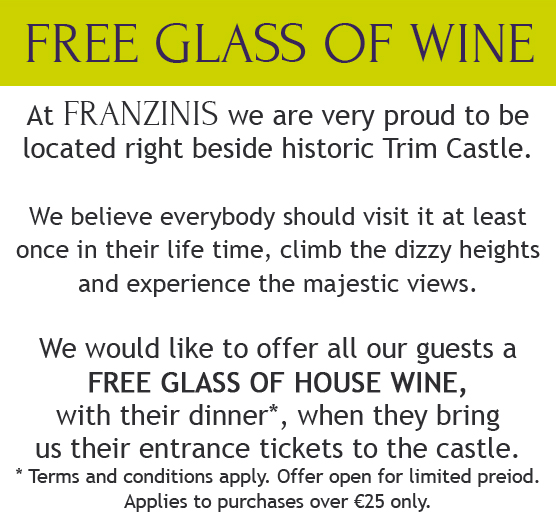 The Friary was founded by the Lord of Trim, Geoffrey de Geneville in 1263, just outside the town walls of Trim. Geoffrey de Geneville retired to the Friary and was buried there in 1314. The Friary was an important part of the town of Trim as it held extensive lands and ecclesiastical and governmental meetings were held there from the 13th to the 15th century. By 1540 the Friary had fallen into disrepair and during the 18th century the buildings were sold and quarried for stone. The Irish Archaeology Field School has been excavating the remains of the Black Friary. Since 2010 annual excavations undertaken by Irish and international students of the Irish Archaeology Field School have helped to reveal the architecture of the Friary along with uncovering burials from inside and outside the church. Courses in Bioarchaeology and Osteoarchaeology on site form part of the research programme for the Blackfriary cemetery. St. Patrick's Church of Ireland church is located on Loman Street on the north side of the town and is reputed to be the oldest Anglican Church in Ireland. This is disputed by a church in Armagh which claims it is 20 years older then the Trim Church. The original church lies in ruins behind the current newer church that faces onto Loman Street from behind a large boundary wall. 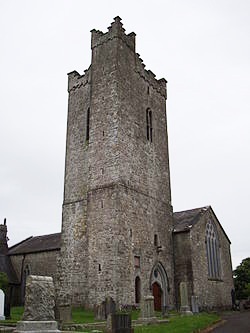 The tower is a remnant of the medieval parish Church of Trim. Bishops have been enthroned here since 1536 but it was not raised to Cathedral status until 1955. The tower clock commemorates Dean Butler, the historian of Trim. Stained glass in the West window was the first ever stained glass designed by Edward Burne Jones. During 1992 the Cathedral was re roofed and beams renewed in the gallery. Trim Haymaking Festival is held in the town every mid June. The Porchfields, an amenity space rich in histpric value, are home to a fair, market and cultural displays.The main event is the traditional making of the first hay of the year by hand and old-style machinery. Meath Roots organised by Meath heritage Centre to celebrate The Gathering 2013, is a special event for those with Meath ancestors. Searching for your roots is an exciting and rewarding pastime but there is nothing like walking the roads or streets your ancestor walked or visiting the church in which they were baptised, married or buried. So if you have Meath roots come along to this special festival and discover it all. The weekend will consist of lectures, visits, festival events and a conference dinner with the presentation of a special certificate to those with Meath roots. 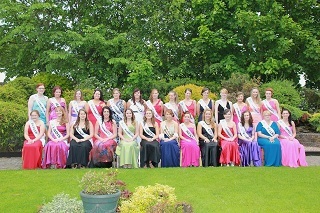 The Royal Meath Show takes place annually in Porchfield on the first Sunday in September each year. The main event of this agricultural show are judging of the cattle, sheep, goats horses dogs and home industries and there are also trade stands and vintage machinery and many other attractions.2013 will see the 73rd annual agricultural show in Trim. It's back! The An Post Heritage Cycle Tour of Meath 2013. Meath LSP are delighted to join forces yet again with An Post, Irish Sports Council, Cycling clubs from Meath, Meath County Council, Meath Tourism, Civil Defence and the Gardai in bringing you the An Post Meath Heritage Cycle Tour 2013. This spin is aimed at families and younger participants and will be held in the environs of Trim. There are 3 loops to choose from to suit all levels and experience. For more information on the tour and for details on how to register and fees please visit [link to event] or contact 046-9067337. The Race is part of the Ultra Marathon Cycling Association (UMCA) World Cup series which includes other huge endurance races such as The Race Across America. The Race is run in association with Navan Road Club. Unlike other cycling races such as the RÁS or the Tour de France, the course is in no way roped off. There are no marshals controlling traffic flow, and there are no planned rest stops or stages in this event. In The Race Around Ireland, once the clock starts in Navan it won't stop until each rider reaches the finish line at the end of the 1,350 mile circuit. This is designed to be one of the most grueling bike races in the World. Further afield to celebrate what has become a much loved tradition here in County Meath. With free children's entertainment, three nights of live music and our attempt to break a World Record, there are endless ways for visitors and supporters to join in the fun.